Dancing Upon Barren Ground by Lesli Westfall is the latest book I’ve received for reviewing. The book addresses the struggle with infertility, beginning with a few short, almost devotional length chapters about approaching the situation with prayer, followed by a section of prayers that make up the bulk of the book, and ending with some insights from the author that come from her own journey. The book in general is great, very straightforward and not a lot of fluff or attempts to minimize. But the prayer section itself is an awesome resource for someone struggling. Each prayer addresses a specific issue that might be coming up in the person’s life, including difficulties with baby related holidays, jealousy, and issues over a past abortion among many many others that are very well targeted and well suited to the situation, and in common conversational language that isn’t going to feel too cliche to someone hurting. It then gives a good number of verses backing up the prayer, giving it strong backing and guiding the reader back to the word for their source. The book is a quick read, but a really strong resource for someone facing infertility issues. When experiencing infertility, the unexpected happens. Your feelings about yourself and your relationship with others and your belief in God are confused and complicated. Dancing Upon Barren Land – Prayer, Scripture Reflections, and Hope for Infertility is a helpful companion for those dark, lonely days. Lesli is no stranger to infertility. She has experienced all the range of emotions, the prodding of doctors, and the stinging disappointments. Yet through it all she’s found significance offering hope and inspiration to the wounded heart of the barren soul. Through her own experience and those shared from others, an online ministry was created Dancing Upon Barren Land ~ Spiritual Nourishment for the Infertility Road. Now she speaks to women around the world through the website and leads locals support groups too, along with providing a resource through this book. Lesli enjoys life. She loves spending time with her husband, Larry, her man of faith and live-in comedian. She loves spending time with her family and friends, and traveling, especially road trips. Most of all, her passion is sharing God’s love and teaching the Bible to women, inspiring beleif there’s healing for the grief of infertility and sorrow from loss, and there is joy in the journey while we wait. Find out more about Lesli athttp://dancinguponbarrenland.com/. I’ve been working off and on getting my garden area ready for another round of attempts. And part of this has been breaking up the soil again… to get it soft enough to be able to mix in peat moss, and make it non-packed so that roots are more easily able to grow through it without struggling to go around big solid clods of dirt. It’s one of those tasks that I’m not a big fan of, because it’s hard. It takes a lot of effort to dig deeper down and sift out any rocks and break through packed areas. And yet, I love the result… both for the later plants, and just for being able to run my hands through the softened dirt. But it’s also one of those tasks that’s hard to completely without having it turn into spiritual metaphors on you. But this year… there’s just this feeling of resistance within me. I don’t want to be cultivated right now. I’m tired… my hardened parts have packed themselves together from what feels like good responses to the weight of the stress put on them… and I just don’t feel like having them broken apart right now. Even though I know it’s for the better for future growth… and I know the hard clods aren’t functional right now and so are basically just taking up space that is needed for roots…. and I know it’s likely to happen whether or not I think it’s what I want right now. But I just feel worn down right now… and tired of dealing with the mess that is my messiness. I’m just sort of wishing my gardener were into rock gardens right now. I’m sort of realizing lately how many things with kiddo are last times… or getting close to last times. Last time I’ll be sitting through the elementary school music program. Last zoo field trip… maybe even last field trip at the end of this year, as I don’t remember taking them in middle school. Probably close to the last real easter egg hunt. Last year of being required to invite the whole class to birthday parties. Last year of having only 50 kids in her grade at school, and having almost all of them the same kids that started out together in kindergarten. I feel like I should be more nostalgic… more sobbing for wishing for more time with a younger kid. Instead, I’m finding myself sort of relieved on a lot of these. Maybe it’s the craziness of schedules and trying to keep everything balanced… but I’m sort of looking forward to having less obligations from her school. Less things to remember, times to juggle around sometimes with short notice, things to fight with kiddo over changes. I’m not sure how we’re going to survive teenage mood swings when we’ve got enough on our hands as it is… but moving on from some of the kid things seems pretty appealing to me right now. 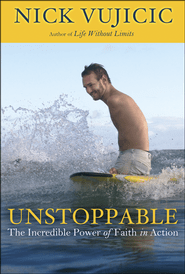 Unstoppable by Nick Vujicic is the latest book I’ve received from Waterbrook Multnomah for reviewing. If the name doesn’t sound familiar, a picture of Nick probably would… he’s hard to forget as a motivational speaker with no arms or legs. The book goes through dealing with all sorts of struggles… from bullies to social injustice to struggles to keep balance… and shows how they can be overcome through faith in God. The book includes a lot of stories of various people who have connected with Nick through the years and their journeys, but also contains a lot about Nick and his life, including struggles with feelings of defeat and the road to marrying his wife. He’s openly honest, even about aspects of his own issues that a lot of people would prefer to hide. It’s an interesting and inspirational… a bit of a motivational tone, but worth the read. I’m so not a competitive person. I’m the type who prefers to just play the game and not even keep score. I’m the one who is always really glad to be playing against someone who is a pretty even match… so that I don’t feel like I have to either throw the game to make it at least a pretty close match…. or shape up to not be too boring when I keep losing. My idea of a good outcome in checkers is when I have a piece in that magic spot in the one corner where I can go back and forth between the next to the last space on the row closest to me and the one that is directly diagonal to it on the other connecting side of the corner block. Can I win the game from there? No. But, neither can the other person do anything to get me when I’m there, so they can’t do anything to win either. Well, this semester, we get to start completing competency exams in clinical, in which we are judged by one of the techs twice on a particular exam, and get them to sign off that we know what we are doing on that exam enough to be able to complete one without a tech in the same room. And suddenly, the race is on. For some reason, this has turned into basically a race with several members of the class to get as many as they can immediately. Now, we don’t actually have to have any of them done this semester… and only 10 by the end of next semester. And most of the ones we’re able to do now are very common exams that there will be tons of chances to do at any point. But you’d think there was a major prize on the line! It’s really starting to get annoying with a few of them. One in particular will basically try to avoid doing any exam that he’s already got his comp on, just so that he’s available in case an exam he does need comes in. I’m starting to lose my patience with this. It’s not like I care that I’m doing a lot of the exams when I’m on at the same time that he is, it just greatly annoys me why I’m doing them. I actually informed him the other day that just because he has a comp on foot, doesn’t mean that he never has to do another foot again… after he’d slid me the third order for a foot that I’d done that day. Which sounds like a small thing… but as seriously non-confrontational as I tend to be, even that’s unusual for me. But I don’t think he got the point anyway. Just hoping after the big rush with the competitive ones, that suddenly they will find a spot that they don’t have many exams that are common enough to get quickly. So I’ve felt a bit like a hopeless turtle this past week. Through a conversation with someone the other day, and today through a tangent thought during a sermon…. I’ve come to realize that the issue isn’t whether or not I feel like a turtle. Because, well, yes. If I’m left to my own resources, that’s pretty much the extent of my power. I can dig myself a nice pit or cave to hide in. But, the issue of hope isn’t supposed to be based on my ability to figure things out. It’s supposed to be based on how much I trust that God can find a use for even a hopeless turtle. Do I trust that he can, and that he will? I’m ok on the “can” part. But I’m never as sure as I should be on the “will” part. I know that he has a purpose for even turtles, logically. But feeling like there’s hope of being anything more functional that a speedbump is often a completely different question. I’ve freshly returned to the point of realizing I’m a hopeless mess on my own. Next step seems to be going from just believing that he could fix a mess to trusting that he will make something out of the mess. Somehow, that step is feeling a bit more like scaling a cliff though. I think one of the things that frustrates me the most in clinical experience is making silly mistakes. Not mistakes because I don’t know what I’m doing… or not paying attention… mainly just mistakes where I’m trying to do several things at once and totally botch what should have been the simplest one. For example, putting the left side marker on the patient’s right side. Or getting ready for an exam, and grabbing a size of image plate that is obviously too small for an adult foot. Just silly things that make me feel like I’m a total ditz. Unfortunately, the more I get worried about making them and trying to focus on making sure everything is perfect, the more likely I am to totally botch some really minor simple thing that slipped through my focus on so many other things. I know it’s just life, and it will get better as I keep gaining experience and get used to doing these things. But it still frustrates me.